Within the county there are a couple of perfectly located and extremely relaxing spa retreat venues throughout Cornwall. The first is the St Michael’s Hotel which offers panoramic views across the bay. Set in its own gardens and only footsteps from a blue flag beach, the St Michaels Hotel could be your perfect place to relax on a spa break in Cornwall. The second is the China Fleet Country Club which is located in Saltash and set in 180 acres of stunning Cornish countryside. This venue offers guests a recently built spa, filled with top of the range facilities. Only 10 minutes from Plymouth and perfectly located for a trips in Cornwall, this venue would be a great place to lay your head after a busy day in the spa and local area. Cornwall is something of a natural beauty, with miles of coast line offering tourists the chance to visit some of the most popular surfing beaches in the country. 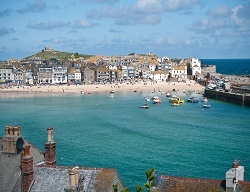 The beautiful sandy beaches in Newquay and Falmouth bring in many tourists. This is due to the great waves that allow surfers and body boarders alike to enjoy the rides. Why not take a few surfing lessons and one of the many surf shops and learn a new sport whilst on your spa break. The beach and coastline also has many walking and cycle routes, including the South West Coastal Path, for tourists to take in the sea air and explore the area. Its easy to find your perfect place to eat in Cornwall, a high percentage of the food is locally sourced and the county prides its self on this fact. What could be tastier than a fisherman catching fish in the morning, and then it being on your plate, perfectly prepared, later that evening? Cornwall is also proud of its bakeries, the common Cornish pasty was originally produced in Cornwall and it’s guaranteed that you haven’t tried a proper Cornish pasty until you sample one from a proper Cornish bakery. Indulge yourself with the local cream teas for a real treat whilst on your spa break.